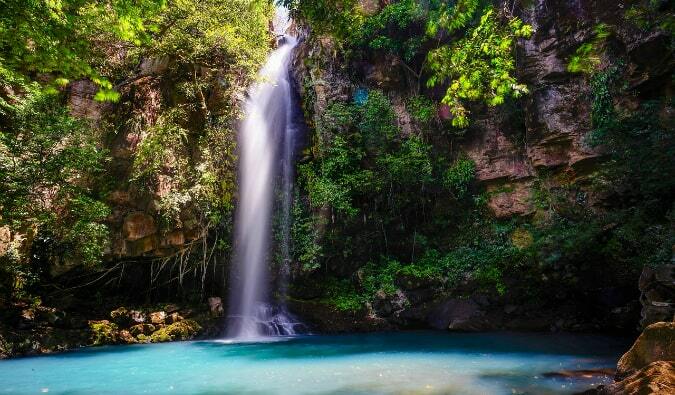 Costa Rica is one of the most visited countries in Central America. American tourists have been flocking to the country for years, and it’s become a hot spot for retirees and expats due to its cheap living, great weather, amazing beaches, and friendly locals. I love Costa Rica. It was the first place that inspired me to travel. I’ve been back to visit Costa Rica many times since then, falling in love with it over and over again. But, because it’s not as cheap to visit as its neighbors, many budget travelers skip over Costa Rica. And, while that’s true (but there are many ways to save money in Costa Rica), in my opinion, the beauty of the destinations below is worth the extra price. Located on the Caribbean coast near Panama, Puerto Viejo is popular with young people and backpackers because of its great beaches, surfing, and party atmosphere. The town is very lively and you’ll find something going on every night. It’s probably the most popular destination on the Caribbean coast. There are also many quiet beach hotels around for those who are looking for some peace and quiet. There is also a jaguar rescue center nearby that rehabilitates all sorts of local wildlife and releases them back into the wild. Cahuita, a tiny town situated right next to a stunning national park with the same name, is about an hour north of Puerto Viejo. Cahuita is a place to relax. There’s one bar in town that gets lively (sometimes it’s half full! ), but for the most part, after a day of hiking, animal spotting, swimming, or surfing, most people just sit around and read. The region is known for its Afro-Caribbean influences, which you might notice in the food and local culture as you chill out with some dessert crepes or grilled chicken. Tortuguero (which means ‘Land of Turtles’) is the Costa Rican version of the Amazon rainforest. 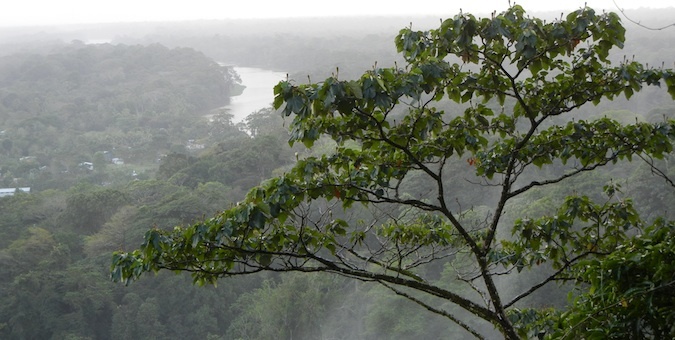 It dominates the northern coast, with Tortuguero National Park spanning over 77,000 acres. This massive area is a series of rivers and canals that crisscross the jungle. The biggest draws to this area are the large numbers of turtles (hence the name) that come to nest along the shoreline. The best time to see them nesting is in April and May, but if you’re visiting during the off-season, you’ll still be able to go hiking and participate in canal cruises. However, there’s lots of wildlife to see year-round. Corcovado National Park is on the remote Osa Peninsula in southwestern Costa Rica. Established in 1975, the park covers an area of 424 square kilometers, making it the largest park in the country. Though more popular than it used to be, it’s still a very rugged, quiet, and off-the-beaten-path destination in a country where almost everything is on the beaten path. The peninsula is not easy to get to (which helps keep tourists away), but your efforts will be greatly rewarded with deserted beaches, tons of wildlife, great hiking, camping, and lots of marine life. It’s one of the best places in the country. To me, this is probably one of the best places in the entire country. Try not to miss it! 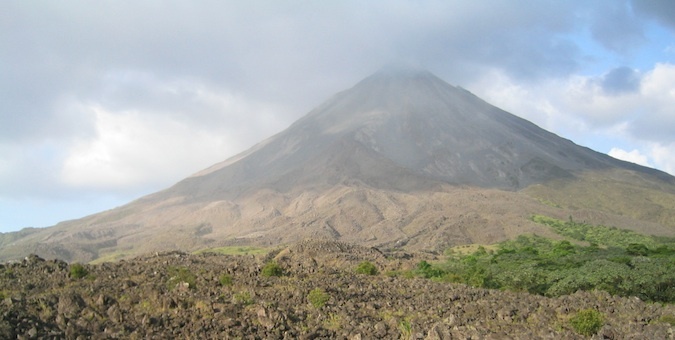 Sitting at an elevation of 1,670m, Arenal is one of Costa Rica’s many volcanoes. It still erupts from time to time, and if you’re lucky, you’ll be able to see lava flowing down the volcano. (Though, it’s less likely to happen as the volcano has been dormant for the last seven years). Fun fact: I got lost in the jungle around here. The area has tons of wonderful activities: there’s awesome waterfall (La Fortuna), the national park with great hiking, sunset views over the lake, caving, rafting options, and famous hot springs. With so much to do, it’s no wonder it’s one of the most visited places in the country. A popular beach destination on the Pacific coast, Manuel Antonio’s wide, white-sand beaches and warm blue waters aren’t the only attractions people come for. The nearby national park, which opened in 1972, sees over 150,000 visitors annually and is home to great hiking trails, a number of secluded beaches, and offers up the chance to view three different kinds of native monkeys. It’s become a lot more crowded and developed over the years. It’s definitely not the park I first visited in 2006. That said, you’ll still see a lot of wildlife and the beaches in the area have been kept surprisingly pristine! Admission to the park is $16 USD per person, though kids under 12 enter for free. The nation’s premier cloud forest is the home to the elusive quetzal birds. 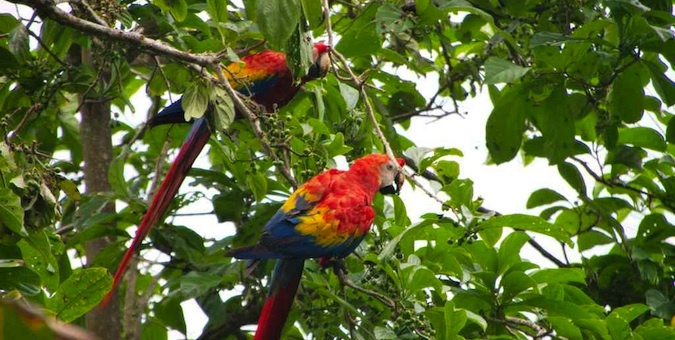 Most people come to Monteverde for a glimpse of this rare bird. The area is one of the largest eco-tourism hubs in the country, and over 250,000 people visit every year. 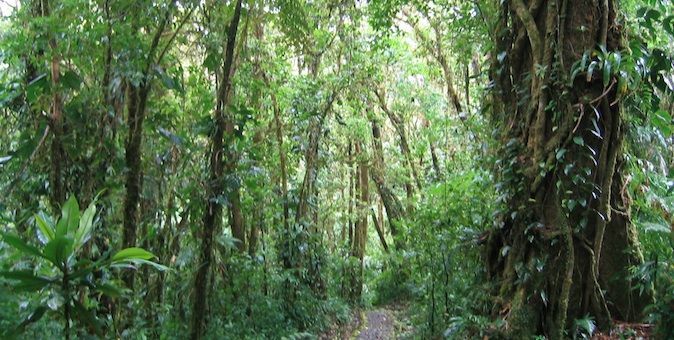 Monteverde, which rests right on the continental divide, experiences high winds and unusual weather patterns. The entire area is very green and wet. Witness it all on a zip-line adventure through the tree canopy or explore some of the sky bridges in the area. Expect to pay around $50 USD per person for zip-lining. 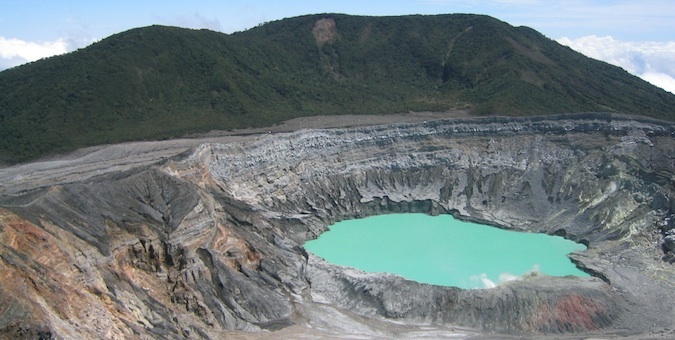 A great day trip from San José, Poas Volcano is an active stratovolcano with twin calderas filled with sulfur lakes. The lakes are so still, you’ll look at your picture and think you painted the color on. The volcanos last erupted in 2017, and have actually erupted 40 times since 1828! There are some small trails around the area too. Arrive early in the morning to avoid the clouds closing in and ruining the view. At the bottom of the Nicoya coast is the hippie backpacker town of Santa Teresa. This “town” is really nothing more than a beach with a road lined with eateries, yoga centers, surf shops, and hostels. Everyone gets up early to hit the waves, so the overall atmosphere in town is pretty relaxed. You won’t find a lot of crazy parties here. Santa Teresa is a good place to lie on the beach, hang out with people, and relax. Because of the “chill” vibe, many people end up staying in Santa Teresa for weeks, and even months, on end. While everything in Costa Rica is a bit touristy and a wee bit crowded, I think the diversity of wildlife, natural beauty, white-sand beaches, amazing sunsets, and warm, clear water make it worth the price. There’s still so many unexplored and unvisted part of the country. Plus, the locals here are super nice and welcoming. Be sure to visit Costa Rica – and use this list to start your planning! Arenal Backpackers Resort – This is a luxurious, laid-back hsotel with a pool that’s great for hanging out and meeting people. Rocking J’s (Puerto Viejo) – The coolest hostel in all the country. This hostel located on the beach is the prime spot to meet other backpackers. Hostel Vista Serena (Manuel Antonio) – With great ammenities, staff, and a pime location, it’s the best place in the area. Want More Information on Costa Rica? 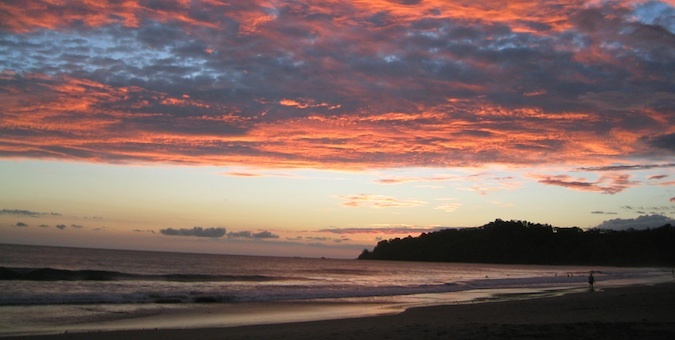 Be sure to visit our robust destination guide on Costa Rica for even more planning tips! I had always heard of Costa Rica being great, but since I always go to Mexico (where my family is), I haven’t really given it much thought. I will definitely have to add it to my to-go list. I like the fact that it seems to not be overrun by American hotels and resorts sort of the way Mexico is. There are many places where it is overrun with Americans but there are also many places where you can check into quiet little bungalows away from the crowds. I wonder what you would think of Santa Teresa now. IT is VERY touristy, but also very beautiful. Sooooo many yoga yoga yoga…I love your site. I loved Santa Teresa so much I wanted to move there. I might still do it, but like you said, ONce you go up and down that ONE street so much, it is more or less a great central location to take busses to Nicaragua, Panama, etc. and even explore the Caribbean side. I am considering a trip to Santa Teresa in March. I am curious how the tourist scene measures up against places in Baja Mexico (e.g. Todos Santos, Pescadero). Awesome! I might be going there with my family in Dec. so I will have to use all your posts esp. this one as a guide 🙂 Also, starting Spanish classes in April, so will have to practice! Bien. En Costa Rica, nesicitas espanol porque mucho personas no hablan ingles bien. Pretty! Love the volcano shot! That photo is one of my favorite photos ever. did you stay at Rocking Jay’s in Puerto Viejo? I spent a week completely lounged out there with my wife and brother, snorkeling and spearfishing by day. Manuel Antonio was amazing for the consistency of the waves for body surfing…we spent 3 weeks in a cabana body surfing, eating ceviche and sneaking into the national park! I did stay at Rocking J’s though that place was not rocking when I went there. I could see the potential but it was very quiet. We were going to skip through Costa Rica as it’s expensive (compared to the rest of Central America) but after talking to the Globetrotter Girls we’ve decided to head to Puerto Viejo next week. 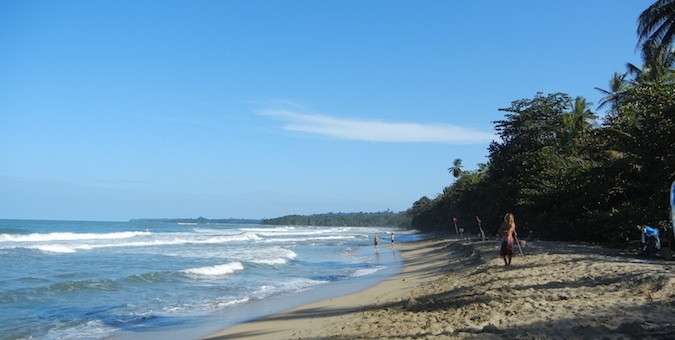 Looking forward to exploring the quieter beaches outside of town and walking in the Cahuita national park. To be honest it doesn’t look much more expensive than Bocas del Toro in Panama, where we currently are. Bocas is pretty expensive. Did you see the Globtrotter Girls there? We spent some time traveling together when I was down there. Great people. Can’t tell you how I miss it also, on your recent travel there have you noticed a higher number of expats living there? Yeah, there were a lot more expats living there than the last time I was there. Still a great destination. 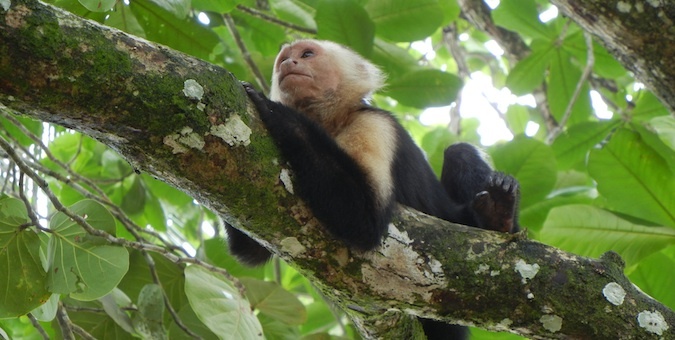 I’m one of those fools who sees the cute monkey in Cahuita and thinks the whole place is a giant petting zoo. The best places to visit involve lush vegetation that includes fascinating (and hopefully friendly) wildlife. Just don’t feed the monkeys! It’s bad for them on many levels! I didn’t make it there. Hello Jessy, Can you still get me a contact for volunteering at the sloth sanctuary? Can’t believe you got to see Arenal – it stubbornly stayed behind the mist while we were there! I got lucky for sure! The clouds came back late afternoon though. what is the best place to fly into? Nice to see you pointing out the gems Matt. Many people are talking about how developed Costa Rica is these days, but there are so many great spots, and actually there are great rural community and farm experiences to be had too, to expose people to the culture. I’ve spent a lot of time in the country so I’m partial to it myself and want people to know what’s good there. Also, if you want to be guaranteed to see the Quetzal, Savegre – another cloud forest area in the south-central part of the country (between San Jose and Dominical) is the best place to see it. But Monteverde is an amazing cloud forest experience not to be missed. Amazing photos! I want to make it there one of these days… looks so nice! Great list of destinations! I traveled all over Costa Rica before finally settling here in Playa Hermosa, Guanacaste, in 2005. I’ve been blogging about it ever since. Pura vida!! my partner and i would like to retire there what made you choose playa hermosa? 1. Corcovado: Yes, worth it, but to my (unpleasant) surprise, most of the trails are through secondary, not primary rain forest. 2. Monteverde: beautiful but you are herded through a narrow, cordoned single one way track/walkway, so very much a sanitised feel to the experience. 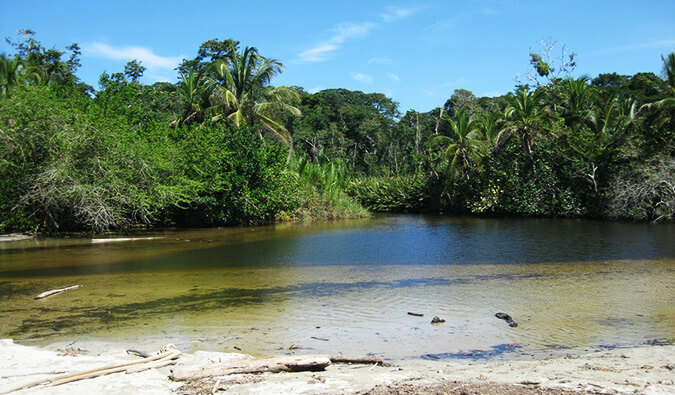 For the best nature experience nothing beat Carara National Park (very few people, you can go off trail, etc). 3. Arenal: was shrouded in mist down to the base: couldn’t see a thing. The guide cheerily informed us no one else had either for the past few months. The clouds apparently clear only when ‘the moon aligns with mars and jupiter is in the seventh house’ : rarely to never. Where is a nice and safe place for a older single lady to stay. I love rain forest, hiking. I’m active. Great list. I lived there for 5 years and explored the entire country. It is hard to narrow down a list that is for sure! Monteverde and Puerto Viejo although quite different from one another are on the tops of my lists as well! All of my husbands family have moved to costa! My brother in-law lives in Cahuita (incredibly happy to see that it is featured on your blog) Cahuita is one of my most favorite places to visit! It is gorgeous, peaceful, and very few tourists. They have a variety of delicious restaurants, and the authentic jamaican pattys (I believe only on the weekends) at the street cart are phenomenal! Can’t wait to go back! I am a 46 yr old woman who works in the public school system. For the past couple years I have desired to live in a different country each summer while I am not working. My plan is to start next summer. In preparation, I am taking a 12 day trip with my middle son (who is 20) to Costa Rica this summer. We will be staying in 4 different places over the 12 days and doing everything from lazy beach days to rappeling down waterfalls,stand up paddle boarding, snorkeling, kayaking, canyoneering, canopy ziplines, 4 wheel adventures, and thermal hot springs. We will be staying at Arenal Springs Resort and Spa (LaFortuna), Hidden Canopy Treehouses Boutique (Monteverde) , Villas Playa Samara (Samara), and finally Hotel Ramada Plaza (San Jose). 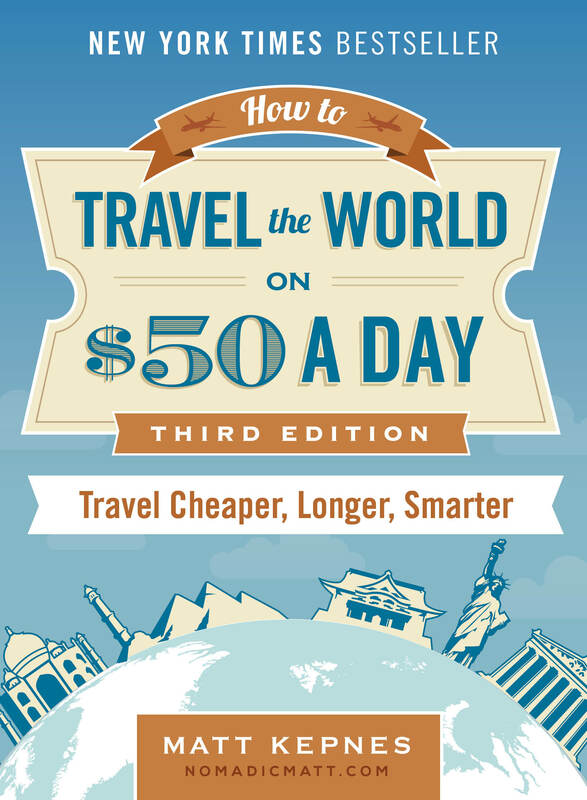 I realize we are going the “tourist” route and likely paying much more than we really need to. My hope is to get connected with someone I can trust so that next summer I can go back with my 20 yr old and my 9 yr old and live there for 6-10 weeks, rent a car (or take public transportation) and have an adventurous, lazy, “local” experience. The plane ticket is about $1000/per person (round trip) so we will need to live a little more on the cheap while we are there next summer. If anyone has suggestions for someone I could work with to actually live there with one minor and one adult child that would be much appreciated. I lived in Costa Rica for 10 years. It was a lovely experience, although now it is a lot more expensive and the central valley is very crowded and congested with traffic. If you want to live in the country, there are a number of American Schools that are always looking for teachers. Sometimes they recruit in the USA, but you could also stop by talk to the staff. do you have any suggestions for places to explore for a home base, like renting a home and near a good town? Also, do you know if one can travel there on a one way ticket? What’s the best way to get around? busses, or do they have trains? I will only have about 3 weeks there, which two places on your list are closest together? I feel like I’d like to choose a couple of places and get to know them well. Just recently got back from a trip to Guanacaste in the Northwest section of Costa Rica. We also took a day trip to Nicaragua – what a trip. Would definitely go back to Costa Rica! We are planning on a romantic getaway to CR coming January and this would be our first visit to CR. I would like to know which places you suggest we cover in our first visit. It seems highly impossible to cover all the great places in CR in span of 7 days. I would love to do the adventure sports and the jungle tours there. What do you suggest? Are there any places for snorkeling ? Not all your followers are young. My friends and I are in our 50’s and we are looking somewhere to go where its tropical with jungle style and then also ocean where you can snorkel and find clear calm water. Is this the place or is there another place you can suggest besides Hawaii. Can’t afford it’s prices. I’m not sure what youth has to do with this list??? Anyways, there’s a lot of snorkeling in Costa Rica. I’d try the Corcovado region of the country. put that together. Very informative. Hey Matt, I have an internet based business and can work from my laptop. I want to go to Costa Rica in February of 2014, and find a place within a short walk to the water, with strong internet so I can work from my spot. I am looking to rent a place for a month, any suggestions as to which town would be friendly to my needs here? I will also be bringing my guitar, singing and playing music, so am looking for a place to stay that is relatively private so as to not bother anyone. My wife and I are celebrating our 10th wedding anniversary in Feb. and planning to go to Costa Rica. We have a week and want to split our time between 2 hotels, one in Tortuguero and the other in Puntarenas on the total other side. My question will it be easy to travel across and not waste to much time and should we rent a truck? 2 part question. Thanks for the help..
I’m from Costa Rica. I recommend you to go to Guanacaste instead of Puntarenas. It has the most beautiful beaches of the country. I am going to Costa Rica for a few months and looking for a small budget priced self contained cabin or loft to rent, in a safe area. I am looking around the Tamarindo area, as I’ve read the surf is good and close to services. So, this way, Costa Rica is #1 country for Eco Tourism. Hi! thanks for everything! we are planning to visit panama-costa rica with a low budget and we have seen that it is possible in your blog but we think that maybe the Caribbean part of Colombia is cheaper. Is it?? We don’t know what to do. Last year we went to Ecuador and we found it cheap. we are from Argentina! Hi Matt, thanks for this great list! I’ll be going to Monteverde next year for the first time. I’m struggling to figure out the best way to really experience it. Any thoughts on taking a guided walk vs. zip lining vs. hanging bridge walk? There are so many options! There’s a lot more to anyplace than a simple list. These are just my favorite spots. What are yours? I have always wanted to come to Costa Rica. This year has been a major struggle. I would like to come and do some soul-searching. I love the beach, love seashells! Not real big on tourists but don’t want to be isolated completely. I am planning to spend a month there. Where would you recommend I go? Hey Matt! Do you have any recommendations for places to stay in Santa Teresa? Everything I’ve found so far has been above my budget, even hostels. I know that this place has blown up in popularity so maybe that’s just what things cost now, but wondering if you know of anything that works for a shoestring budget. No luxury or fanciness required. I don’t know what the current prices are. I think I paid about $15 for a dorm room. We’re heading to the Osa Peninsula for a few days. Do you recommend the Carate side or the Puerto Jimenez side? Hey Matt! I have been silently reading your blog for months now, thanks for all the great advice! I am spending a month in Costa (primarily Pacific side) this summer, and was curious how easy you found the accommodations-finding to be. I usually never book ahead except for the city I’m flying into, but I’m nervous that with small towns + beach the cheaper places could go easily. Any suggestions/ personal experience would be greatly appreciated! It’s every easy to find last minute accommodation in the country. Hello Matt. Without a doubt all the places you mention qualify as “must visit” destinations in Costa Rica. I live in Costa Rica and personally love vacationing around Puerto Viejo, to be more specific, I like the area called Playa Chiquita. It is less crowded than downtown Puerto Viejo and there the reefs form a lot of natural pools which offer nice bathing areas, but also result in great scenery. I was hoping you could help, I am travelling Costa Rica for a month so I can go anywhere I like, lots of adventures I hope but I’m stuck for the start. After arriving in San Jose I didn’t want to stay there, I will do a couple of days at the end, but where do you think the best place to head to first is? I can’t seem to find other people’s itinerary as such, just places they like and I’m unsure where to head to first! Thank you!!! Hey! I’m not Matt but I have been to Costa Rica and recommend a couple of places to go to then make your own itenarary. First get a transport immediately out of SJ to either Dominical or Manuel Antonio. They are close enough to get to when flying in. Stay there as long as you want but it’s a good central location to start with. 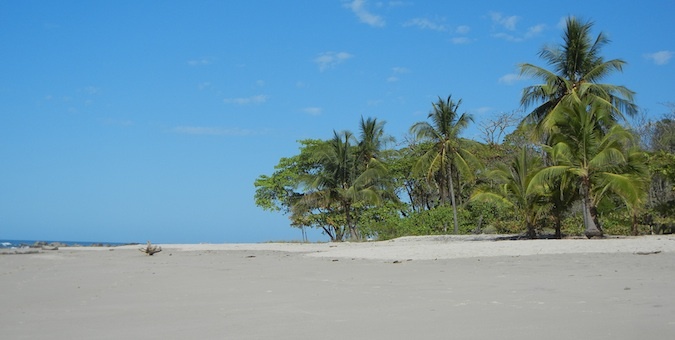 I also recommend the Osa Peninsula or Corcovado! Stay there at least 3-4 days!! Something to remember for a lifetime! Look into San Gerardo de Dota it’s a more secluded cloud forest. And puerto Vieja is not very far from there. While you are there you can float the pacuare river! They will transport you anywhere included in cost of float so you can have them take you up north (like arenal or Monteverde) but also check into the Rincon de la Vieja area! Hope I helped in time. Me and my fiance are traveling to Costa for our honeymoon, in October. It will be our first time, and pretty much first time out of the US in general. We are so confused as to what and where to go. It is a 6 night vaca. So far, we are flying in to and getting picked up at SJ at 10:30am day 1. We travel to Puerto Viejo and stay for 3 nights. We are then heading to Arenal (with the Pauco whitewater tour on the way) and staying for our remaining 3 nights. We leave Arenal at 6am and head to the SJ airport to come home. I feel like we are going to spend the majority of time driving ( ie SJ-PV, PV-Arenal, Arenal-SJ). Should we add an extra night?? if we do should it be in PV or Arenal? Love your comments. We are returning again for a second time this March. Do you know much about San Gerardo de Dota? We are going to avoid the crowds at Monteverde and we heard it was a great cloud forest. However we don’t know much on how to get there besides taking the public bus? No one was transporting? Also what are your thoughts about Rincon de la Vieja? We will be staying at La Anita Rainforest Ranch. My last question is we will be flying into San Jose early on our last day and want something to do (not walk around downtown) is there a place close to outskirts of the city where we could do canyoning or something adventurous ? Hi! We are traveling to Tortuguero and Corcovado in Costa Rica next month. Our first two nights are in Tortuguero and then we are flying to Drake Bay and staying three nights. What is Drake Bay and Corcovado like? Tortuguero sounds fantastic. We plan to go end of May until begining of June. Any chance to still see turtles during this time? Another question: Best to travel by public transport, private buses/shuttes or car rental? I’m not sure when turtle season is. You’ll have to look it up online. The area is like river basin so it’s all boats. You can do it on your own but it’s worth it to go via the accommodation you’re staying at and they can set it all up. It’s much easier. Hi i am coming to Costa Rica towards the end of June, could you give me some advice as to where the weather may be better as i am aware it can vary somewhat. Also i will be travelling alone so it would be nice to stay in a slightly busy area with good nightlife. I will be flying out from SJO so a destination closer to the airport may be better for me. Any help and advice would be much appreciated, thanks! Thanks for all the great info about Costa Rica! I am planning a trip to CR next week and some of the transit issues are stressing me out! The plan is to go from Monteverde over to Samara and then work our way down the coast to Montezuma via bus then ferry to Jaco and bus back to San Jose. The problem I’m having with this is the bus situation!. I am seeing buses to Monteverde from San Jose and buses to Samara from San Jose but it seems ridiculous to have to backtrack all the way to San Jose to get to the Nicoya Peninsula if we are already at Monteverde. Have you encountered any way around this? Any info much appreciated! Feeling a bit overwhelmed trying to plan this on a budget and fit as musch as possible in 10 days. Thanks! I’m planning a last minute get-away to Costa Rica in July , probably I’ll have 3 weeks there. You recommend the Caribbean coast, but it’s super rainy in the summer. Anything interesting and less touristy you could recommend at other parts of the country ? I’ll be travelling on a shoe string, classic backpacker style – getting a flight there in July from Europe already beaks the bank. Any advice? Hi Matt I’m looking to book a two week honeymoon in May can you suggest any destinations with nice all inclusive accommodation near white sandy beaches but close to a semi lively town as although we are in our 40s we like to meet other people and some nite life. ill be volunteering in puerto jiminez in april for three weeks then im wanting to explore costa rica and Puerto viejo seems like the place id like to go! would you recommend booking a hostel / hotel in advance or just getting the bus and finding accomodation on the day ? Great Post Matt! I currently live in Costa Rica and have been to all the locations on this list except Cahuita and Santa Theresa. I would have to say that so Manuel Antonio is my favorite beach location because of the wildlife. I live in Jaco so its pretty close for me but there is a nice beach called Playa Blanca that is super close to Jaco. If you are ever back you will have to check it out. Also I have fell in love with the mountainous areas near Chirripo. If you are ever back be sure to connect with me and it would be great to see you at Jaco Ropes. I’ll be going to Costa Rica and on the last 3 days of my trip I’m splitting them between Jacó and Manuel Antonio. In which of the two do you think would be best to spend 2 of those 3 days? Hi Matt, do you think two weeks is ok to see a little bit? and also, would you recommend renting a car or just going by bus everywhere? In your opinion which did you like more overall…Jacó or Manuel Antonio? I’m deciding where of the two cities to spend 2 days/1night in and which one I should spend 1day/1night. Though touristy, I love Manuel Antonio. There’s just so much wildlife there! I’m shocked how expensive CR is, definitely not a budget backpackers dream. I’ve found Airbnb to be better than hostels most often for two people. We head to Nicaragua soon so hopefully we can enjoy a beer and not break the bank. We want to spend a week somewhere in Nicaragua but can’t decide to use Leon or Granada as a base for that week. We are already spending 3 days at lago de Apoyo and 5 on Ometepe. Any suggestions? Driving to palo verde river tour was totally amazing. The road just before you get there should be named iguana alley. We must have seen hundreds of green and brown iguanas crossing the road. We lucked out with the river tour. It was raining when we started out so it was just us, the captain and the guide. Next boat was packed….I normally prefer to do my own tours but its not possible in this national park. The river made me think of a very heavily densed tropical foliaged sides area with a muddy river ( the nile –havent been but i imagine –comes to mind) but it was cool with monkeys, crocs, iguanas, basilisks etc. They also have ziplines that we couldnt do due to the weather (you cant zipline if you have thunder as it can hit the lines you ride). The rincon area is really cool. There is the muddy volcano like area we had planned to see but didnt and instead ended up on the opposite side, the more eastern area of the park. It was lovely– jungely as well as some savannah, waterfalls and pools to swim in, natural sulphur hot spring pools and the stunning blue butterfly flying around. Its a nice hiking area and not very busy ( except we had a school class when we were there but no tourists besides that). Leaving for Costa Rica in May for 2 weeks. Our daughter is already at National University in Heredia, of course we are planning to tour while we are there. Lots of information out there. We are used to doing research and doing our own touring. Would love to know the best places to go. 2-3 days here 2-3 days there kind of schedule. We will be in Heredia and San Jose the first couple days and we have already booked a room in Jaco for 3 nights. I was thinking we would move north up the coast to Tamarindo. Still trying to figure out the rest of our 10 day journey. I’d love any suggestions.